Valentin Diaconov (1980) is the third curator in the Stroom Invest Week Interview Series. He is a Moscow based curator and editor. Valentin Diaconov has a PhD in Culture Studies and has written a post-graduate thesis about the changes in Soviet cultural policy in the aftermath of Stalin’s death. Since November 2016 he has been a curator at the Garage Museum of Contemporary Art in Moscow. Valentin, could you introduce yourself a bit more? Sure! I started as an art critic in the early 2000s and worked for several Russian-language publications, contributed to artinfo.com, artnet.de and Frieze. As a curator I have worked independently since 2012, staging shows in state museums and private institutions. My primary area of concern, and this is something I share with a wide variety of colleagues, is the political, social and physical status of an artwork in the contemporary stream of content. I live and work in a country where the intellectual class is singularly obsessed with ways that art can be instrumentalized as a political tool, either fighting the oppression (Russian post-slavery literature, e.g. Dostoyevsky and Tolstoy) or imagining ways of creating new oppressive regimes through either emancipation of the working and peasant forces (Constructivists) or selling the narrative of a new and just society (Socialist Realism). This dialectic of oppression and emancipation of artists having degrees of complicity in certain outcomes (political terror, neoliberal selective permissiveness), is always somewhere on the table, and that is why I am always interested in big projects and big gestures that surround the Errinerungskultur in Germany, for example, – a great and relatively fresh instance of this is David Chipperfield‘s renovation of Haus der Kunst in Munich. Or how artists from the so-called BRIC countries, the neighbouring nations, and Africa retrospectively interpret modernity as something that either is always a tool of oppression or exists in independent forms all along, beside the colonizers’ version of what it is to be civilized. So yes, memory and technology is something that I always take into account. I started at Garage in November 2016 and had since then organized a show Congo Art Works: Popular Painting, originally curated by Sammy Baloji and Bambi Ceuppens. Garage has an English-language series on Russian art and institutions, Exhibit Russia is an example. Even before I started working here, there was this idea of preparing a book on Russian performance art from the 1910s to the present day, so I am now overseeing and writing the overview parts for this, trying to include more information on performance as an urban practice, laws that policed common space and other information that gets usually overlooked in favour of individual biographies. I am also co-curating a conference on artistic archives. This conference, Archive: Savior, Inventor, Witness, was also there before. Me and my co-curator Anastasia Mityushina invite people who know about the archive’s instability in times of censorship, terror or crisis, and will address these histories. Finally, a show I’m doing – and the idea originated with me – is about, in a word, clothes outside the fashion context. So I’ll be looking at how clothes and garments have functioned artistically to serve as cultural identity marks, class identity research, ground zero for abstraction, and a metaphor for masses of the twentieth (and twenty-first) century. You work as an editor, a curator, co-organise a conference, you work on a variety of projects and in different fields of art. In what way do they differ? Or they don’t at all? Yes, they differ as processes (writing is the loneliest job, but the most singularly rewarding), but there’s a common quality to them in that I try to make them as instructive and rich in context as possible. Do you come from a family where art played an important role as well? Or is it something that became more important when you started studying? I was born in 1980, five years before Perestroika, and politics was obviously a huge topic in the household, we got a front row seat to gradual – and in 1991, dramatic – introduction of capitalism. English was a second language – my mum is a translator and my dad had a CD shop for the rock fans and weirdos. Less art than album artwork, really, in the house, so my first aesthetic experiences started with Creation Rebel’s Psychotic Junkanoo cover. Art as a historical concept began to interest me only in the university. What made you decide to study in the field of arts and culture? Do you remember somebody you met at the university or something you did that still inspires you today? 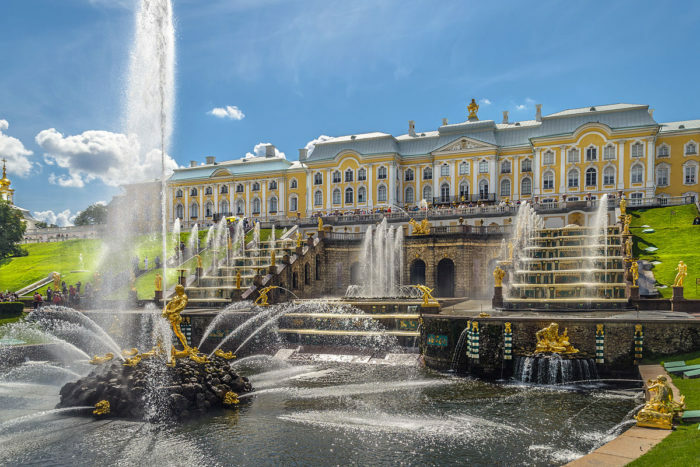 I think going to Peterhof, a tsar residence close to Saint-Petersburg, and realizing that there are total artistic environments that are equal parts architecture, design and art was crucial for me. Is that something you want other people to experience as well? Oh, definitely. We still owe a lot of our notions, stereotypes and opinions on how art works to aristocracy’s glorifing itself, so to delve into the source is instructive, whether it’s in Russia or Milan or wherever. The Garage Museum of Contemporary Art is a place for people, art and ideas to create history. It was founded in 2008 and is the first philanthropic institution in Russia to create a comprehensive public mandate for contemporary art. It is a major art institute located in the Gorky Park in Moscow. It houses an expanding collection of modern and contemporary art, founded upon the private collections of founders Dasha Zhukova and Romin Abramovich, and it organises temporary exhibitions, events and educational programs to reflect current developments in Russian and international culture. The museum wants to create oppurtunities for public dialogue in Moscow. The Garage Museum’s program reflects the current developments in Russian and international culture. Could the museum be located elsewhere in the world? I think that we walk the line between being an international institution and working for the local audience. We try to make these goals not mutually exclusive, and in this respect we could be in another place that has the same amount of interest in and awareness of contemporary art and a similar level of art industry as Moscow. Could you name some places with that same amount of interest that you’d like to collaborate with in the near future? We have a lot of partner projects with different institutions all over the (Western) world, but we usually tend to work with established museums to learn from them. We have a David Adjaye show from the Art Institute of Chicago, a Raymond Pettibon retrospective from the New Museum (New York), Congo Art Works was originally shown in BOZAR (Brussels), and so on. But I wouldn’t put a collaboration with a smaller instution off the table. From your experience what would your advice be to beginning artists? I think that my advice to beginning artists would be: the art world is a very safe place fenced by a huge amount of privilege, so it is always instructive to jump over this fence or at least acknowledge its’ existence. Finally, what are your plans for the future? What do you do in let’s say five years from now? Hopefully doing more shows, writing more books, learning how to drive and roller skate, and collaborating globally!